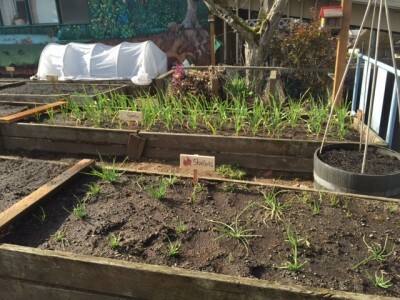 Our school garden has 12 raised beds and an herb garden. My plan for the garden is to show the kids, teachers, and families who wander through before and after school, what can be grown seasonally. 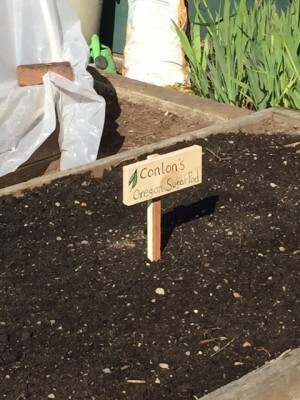 There were never any signs indicating what was happening in the garden so at the beginning of the school year, I made a sign that said, “Fall in the Garden” and listed some of the activities we’d be working on that season. I’ve continued to change the sign each season and it has been well received. 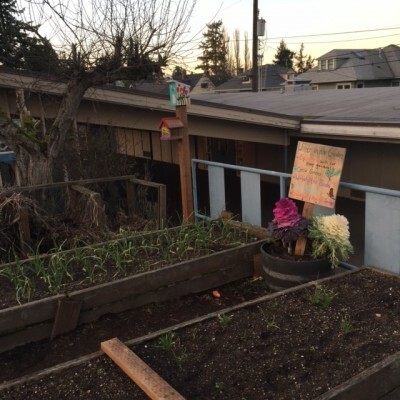 I try to tie in what’s being planted, what’s happening in nature, and some kind of fun project that incorporates gardening with other things, like cooking. In the fall, we made pesto in a second grade classroom and also made refrigerator dill pickles. It was really fun to take produce from the garden and show what can be done in the kitchen. I was surprised how many kids loved pesto! I don’t think either of mine would be so eager to taste it! I’m hoping to do a lesson on homemade salad dressings and vinaigrettes once our lettuces are ready to harvest later this spring. One of my goals is to show the kids how we connect to nature and hopefully deepen their connection before they move on to middle school. I make a point to talk about worms and little bugs working their way through the soil. We stop to look and listen to the birds. 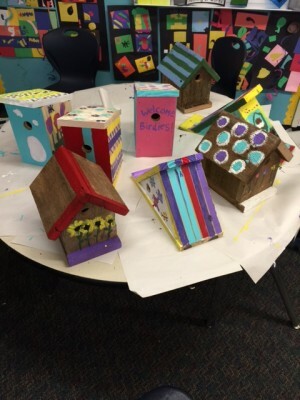 In Gavin’s second grade class, Adam and I helped the kids build and paint birdhouses that we installed throughout the garden. I’m doubtful that birds will actually nest in theses houses being so close to the school playground but I think the birdhouses serve as a reminder to pay attention to things outside the human world. Also, the birdhouses are just cute. They make the garden look more playful and cheery. I’m also trying to incorporate science and history with our gardening projects. In first grade, we’re doing a “First Peas to the Table” contest, based on the children’s book by Susan Grigsby. 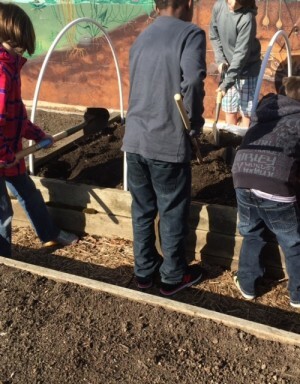 The story is about how Thomas Jefferson inspired a school garden. I went into each classroom to read the story and talk about how peas grow. Each class planted a different variety of peas and we will see which class makes it to harvest first. We also talked about keeping a gardening journal like the journals that Jefferson kept. The kids are keeping track of how their peas plants are growing each week. In fourth grade, we’re running an experiment on soil and air temperature and the effect each has on seed germination. We planted two identical garden beds and covered one with a plastic hoop. The kids are also keeping a journal to note any comparisons. Next month, I’m taking a kindergarten class out to plant native milkweed to create a butterfly garden. It’s a great opportunity to leave an impression on a lot of kids. I think we all hope to do something meaningful with our time and I’m so glad that I am able to share my love of gardening. It’s a great way to be involved at my kids’ school and give back to the community where we live. I never would have thought that I’d become a “garden lady” when I grew up, but here I am! Life is so wonderfully surprising. Hey Lady, How ya operating that there lawn mower?